It takes up little space, is light and easy to carry. Beta "1/2" long hexagonal socket is a replaceable cap designed for use with other Beta tools. Allows fast fastening and loosening of bolts or nuts using an attached ratchet handle or a knob with socket for sockets. Place the product in a 1/2 "socket. The replaceable socket system provides a full range of tools at an affordable price. In addition, it takes up little space, is light and easy to carry. Summary Beta "1/2" long hexagonal socket is a replaceable cap designed for use with other Beta tools. Allows fast fastening and loosening of bolts or nuts using an attached ratchet handle or a knob with socke.. The 900AS Series 6-point SAE (fractional inch) sockets from Beta Tools fit any standard 1/4" square drive ratchet handle or driver (sold separately). The polished finish looks great and wipes down for.. Beta "1/2" long hexagonal socket is a replaceable cap designed for use with other Beta tools. Allows fast fastening and loosening of bolts or nuts using an attached ratchet handle or a knob with socke.. Beta "1/2" long hexagonal socket is a replaceable cap designed for use with other Beta tools. Allows fast fastening and loosening of bolts or nuts using an attached ratchet handle or a knob with socke.. Beta "1/2" long hexagonal socket is a replaceable cap designed for use with other Beta tools. Allows fast fastening and loosening of bolts or nuts using an attached ratchet handle or a knob with socke.. Beta "1/2" long hexagonal socket is a replaceable cap designed for use with other Beta tools. Allows fast fastening and loosening of bolts or nuts using an attached ratchet handle or a knob with socke.. 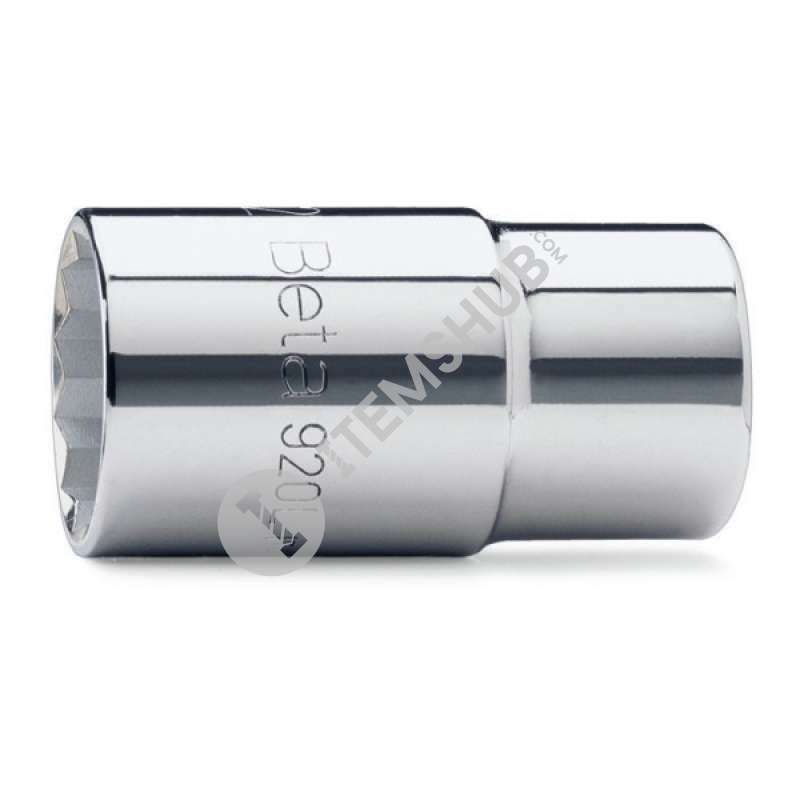 Beta "1/2" long hexagonal socket is a replaceable cap designed for use with other Beta tools. Allows fast fastening and loosening of bolts or nuts using an attached ratchet handle or a knob with socke.. Beta "1/2" long hexagonal socket is a replaceable cap designed for use with other Beta tools. Allows fast fastening and loosening of bolts or nuts using an attached ratchet handle or a knob with socke.. Beta "1/2" long hexagonal socket is a replaceable cap designed for use with other Beta tools. Allows fast fastening and loosening of bolts or nuts using an attached ratchet handle or a knob with socke.. Beta "1/2" long hexagonal socket is a replaceable cap designed for use with other Beta tools. Allows fast fastening and loosening of bolts or nuts using an attached ratchet handle or a knob with socke.. Beta "1/2" long hexagonal socket is a replaceable cap designed for use with other Beta tools. Allows fast fastening and loosening of bolts or nuts using an attached ratchet handle or a knob with socke.. Beta "1/2" long hexagonal socket is a replaceable cap designed for use with other Beta tools. Allows fast fastening and loosening of bolts or nuts using an attached ratchet handle or a knob with socke.. Beta "1/2" long hexagonal socket is a replaceable cap designed for use with other Beta tools. Allows fast fastening and loosening of bolts or nuts using an attached ratchet handle or a knob with socke.. Beta "1/2" long hexagonal socket is a replaceable cap designed for use with other Beta tools. Allows fast fastening and loosening of bolts or nuts using an attached ratchet handle or a knob with socke..